Being sick isn't fun. I mean, I guess that something we all know, but we seem to forget it... until that is we actually get sick. That was, unfortunately, what happened to me this weekend. But hey, it gives me an excuse to drink tons of tea and be super lazy. So that's a plus. Fortunately in the way of pastry, I had a backup recipe I made two or three weeks ago that didn't get posted, and was super good. 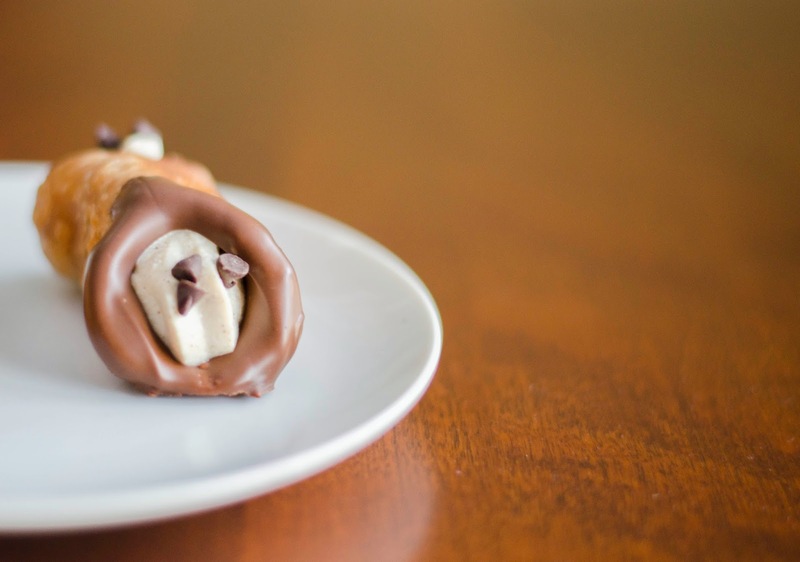 Cannolis, in my opinion, are a staple for any bakery. Yes, right along with the sugar, flour, and salt there should be cannolis. They are a perfect mid-day treat, or dessert and you can usually tell a good bakery by their cannolis. Granted, this being the first time I made cannolis mine wouldn't have come from such a bakery, but that's the learning process. Combine flour, granulated sugar, cocoa powder, cinnamon, and salt in the bowl of an electric mixer. Add Marsala and oil, and beat on medium speed until dough comes together. Using your hands, knead dough on a lightly floured work surface about 10 minutes. * Wrap in plastic, and let rest 30 minutes. Divide dough into 2 pieces. Roll out on a lightly floured surface into a thin sheet of dough. ** Cut out rounds with a 3 1/4-inch cutter. Gather scraps and reroll. Pour enough oil into a large, heavy saucepan to come about 4 inches up sides. Heat over medium heat until a deep-fry thermometer registers 380 degrees. Wrap each round of dough around a 3 3/4-inch-long cannoli form, sealing with a dab of egg white. Working in batches of 4, fry until golden, about 1 minute. Using a wire skimmer or tongs, transfer to paper towels, and let cool 5 minutes. Carefully slide out forms, and let shells cool. Continue rolling, cutting, and frying the remaining dough. Mix filling ingredients together. Cover and refrigerate 4 hours. When ready to serve, use a pastry bag with 1/2 inch star tip. Pipe filling into one end of a shell to the center, then into other end. Repeat with remaining shells and filling. 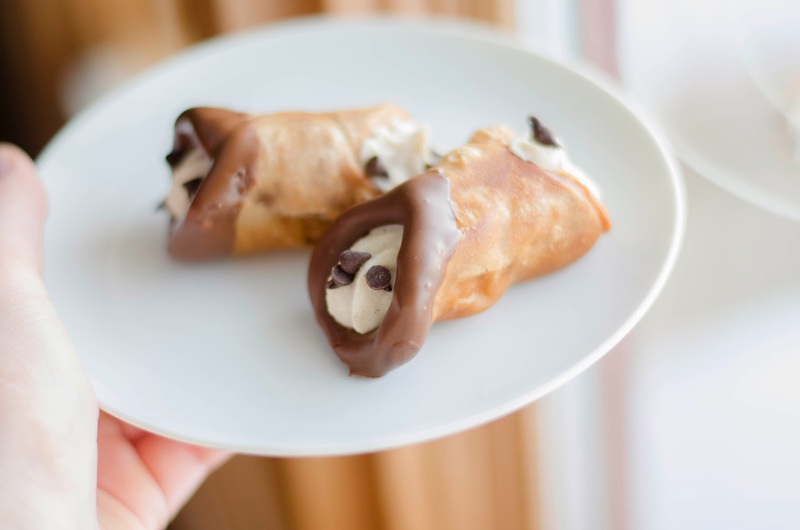 Sprinkle mini chocolate chips onto cannoli ends. *The original recipe called for 15 minutes of kneading until your dough is smooth and elastic. I kneaded for 15 minutes without reaching this consistency, but because I was pressed for time I simply went on with the rest of the recipe. For my second batch I kneaded only 10 minutes and left both to sit for 30 minutes and both became smooth and elastic after sitting on the counter. ** It is very important to not roll out the dough too thin. I had this issue at the beginning and had to re-roll. Keep it to about 1/2 a centimeter.